When building a home theater, the right home theater seating will be a clear centerpiece of your efforts. How people sit is as important as what they are watching on the screen. 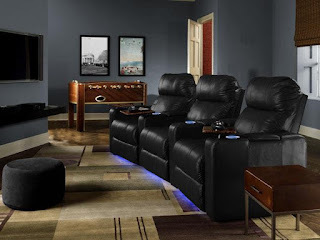 Comfort, look, convenience, and cost will be the four major factors to consider when choosing the right seat for your home theater, and you want to make sure you do it right the first time. In order to help you do so, let’s examine some of the key factors which you will want to focus on when choosing the perfect theater seat for your needs. The first element, comfort, is perhaps the most essential. Audiences want to be able to relax when they stare at the screen, and not have to worry that the seat is too stiff, not the right size, or that the material is not to their liking. Seats come in all shapes, sizes and comfort levels, so it’s important to read the description for each product before purchasing. If you are near a showroom, take the time to come down and sit in various seats for yourself. There’s nothing like the actual experience of feeling how your body contours to the chair. Are you able to “sink in” to the cushioning? Is there a headrest? Does manual or power recline make the difference for you? 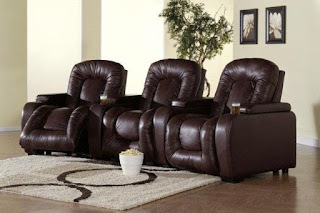 Remember, a home theater seat is meant to last years, and you don’t want to have to return what you got and start over. If you are not near a showroom, don’t hesitate to call 4Seating and one of our experienced customer service reps will be able to go over the details of each chair with you. Related to the idea of comfort is the placement of your home theater seat. Measuring the dimensions of the room to be converted is essential in figuring out the size and number of seats which you will be able to fit comfortably. Also, be sure and factor in the placement of a row of seats with respect to the sound coming from the TV screen; stand at various points in the room to find out which placing will give you the best audio experience. Most of the chairs now offered by 4Seating now come with “Wall-Hugger” seating, which allows them to recline even when placed inches from the wall. This permits for more convenient placement; also check if a seat has space-saver arms. The look of your theater seat is another no-brainer: you want something that will fit the design layout of your new theater. In that case, pick a color which will coordinate with the walls, floor and other home theater décor items in the most eye-catching manner. 4Seating offers chairs in a wide array of styles, from retro to modern, and each product page features a slideshow of photos you can scroll through to look at the chair from any angle. Finally, consider the material. Between leather and fabric, leather is the easier to clean and maintain, although fabric is the better value. If you are looking to choose a fabric chair, it’s best to choose a thick, dark fabric that will hide spills and be easier to clean. You will also want to check out the accessory options for each chair, in order to tailor the seat for your specific needs. Choose LED lighting to add marquee-style décor and find your way in the dark. Tray tables and wine glass caddies will allow you to dine with convenience. A tablet holder may be perfect for kids, or for connecting the internet to your home entertainment system. 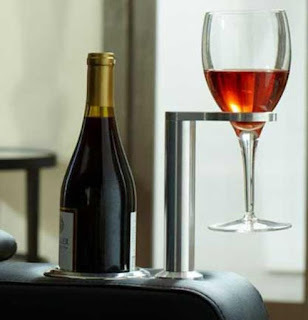 Your home theater seat can truly become an all-in-one accompaniment to your theater! Finally, you will want to cross-compare to figure out which seating arrangement will provide the most bang for your buck. Remember that this seat is an investment which will give back for years to come, so you should also choose the right materials, accessories and number of chairs to fit your needs. Don’t just pick the first chair you see; browse through our internet catalog, or come to a showroom and take the time to pick the seat that’s perfect for you.